Tagging is when you write a Facebook status update and provide a link to someone’s personal timeline or business page. When you tag a person or page, that person or business is alerted that you’ve shared something. When people see the update, they can click Jen’s name to visit her personal timeline. Facebook will alert you if you’ve been tagged in a status update. If you tag a friend in a status update, that doesn’t mean everyone has access to his or her information. What people see when they click to your friend’s timeline will depend on your friend’s current privacy settings. Tagging a person or page in an update is easy. Type @ and then start typing the name of the person or page you want to tag. 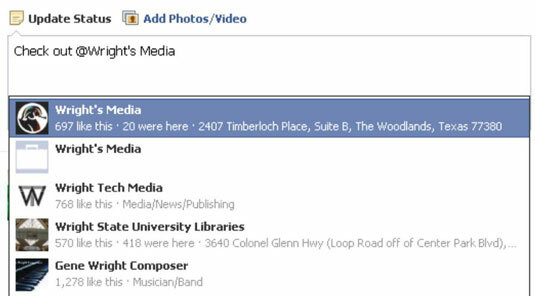 For example, if you want to tag Wright’s Media in an update, start typing @Wright’s, and Facebook displays a list of related people and business pages for you to choose from. You can tag up to fifty people or pages in a single status update. When using your timeline, you can tag people when writing a status update or when commenting on a status update. You can tag business pages even if you haven’t Liked them. Business pages can’t tag individuals in a status update. Business pages can tag other pages even if the page hasn’t been Liked. Business pages can tag an individual in a comment if that individual left a previous comment in the thread. For instance, suppose someone comments on a post at the Crowdshifter business page. If you aren’t Facebook friends with this person, you can’t write a new status update and tag that commenter. However, because the person commented on a status update, you can now respond to him or her in the comments section of that same thread and tag that person. Facebook lets the person know that he or she was tagged and can read the response. It’s best to tag people only if you know they won’t mind. It’s especially important to ask people if you can tag them when you’re using Facebook’s check-in feature. If you’d like to control whether people can tag you, adjust your privacy settings. Click the gear icon, click Settings, and then click Timeline and Tagging. You can adjust a variety of settings that help keep Facebook in line with your preferences.